Complete functional vascular diagnostics in a small, portable instrument incorporating latest technology: VICORDER® Vascular Complete Model . Comprehensive functional vascular diagnostics in a small, portable instrument incorporating latest medical technology : VICORDER® Vascular Complete Model offers a host of applications from vascular lab to angiology, phlebology, cardiology, nephrology, pediatrics, epidemiology, or even in interdisciplinary use, from screening to research, from a private outpatient clinic to a university hospital. VICORDER ® has proven its adaptability and flexibility with vascular specialist around the world from Auckland, New Zealand, to Zurich, Switzerland. Based on the quality of results and its operator independence, the instrument has been chosen by renowned research institutions and used in numerous studies as the ever growing number of publications documents. The small VICORDER fits well on your palm. Yet it integrates all functions of a complete vascular lab: Doppler, Pulse Volume Recording, Oscillometry and Photo Plethysmography, dual channel testing. The compact VICORDER® case, weighing less than 600 grams, houses medical high tech: Digitally controlled pneumatics inflating and bleeding the cuffs, sensors for pressure and photo plethysmography, Doppler and remote control. A miracle in efficiency and user friendliness. All these features right at your fingertips! VICORDER® does not require a big cart, no redundant hardware. Via a fast USB adaptor, additionally serving as a power supply, VICORDER can be connected to (almost) any standard PC. In combination with a notebook VICORDER® becomes an ultra portable vascular test system. Including all accessories for bilateral testing, VICORDER® will fit into a briefcase together with a notebook, allowing you to apply the VICORDER wherever you need it, in your lab, bedside, in your outpatient department, or during visits. 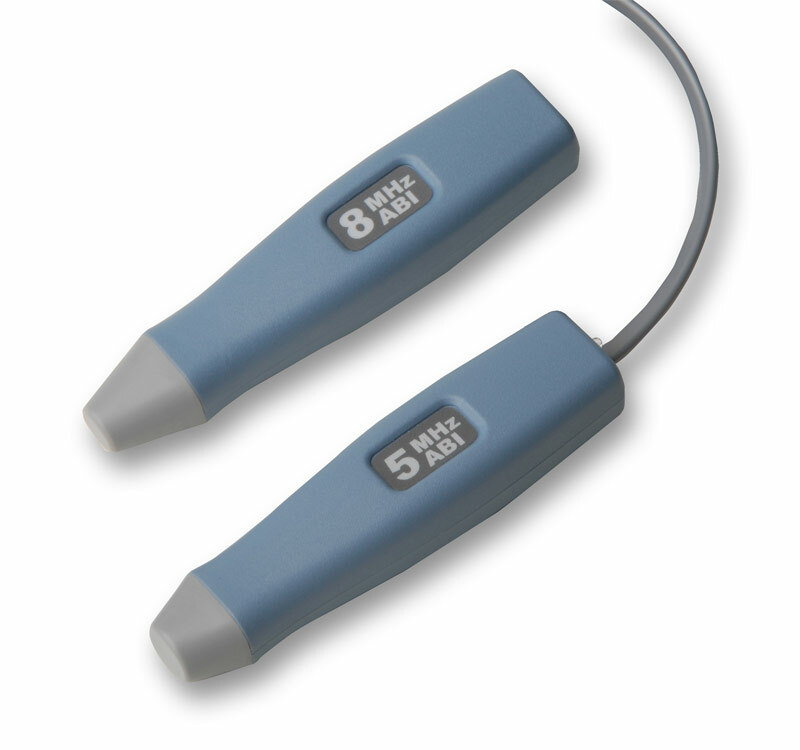 The integrated Spectral-Doppler connects to CW-probes with 5 and 8 MHz, capable of sensitively insonating small vessels, even at compromised perfusion, as well as large and deep vessels. 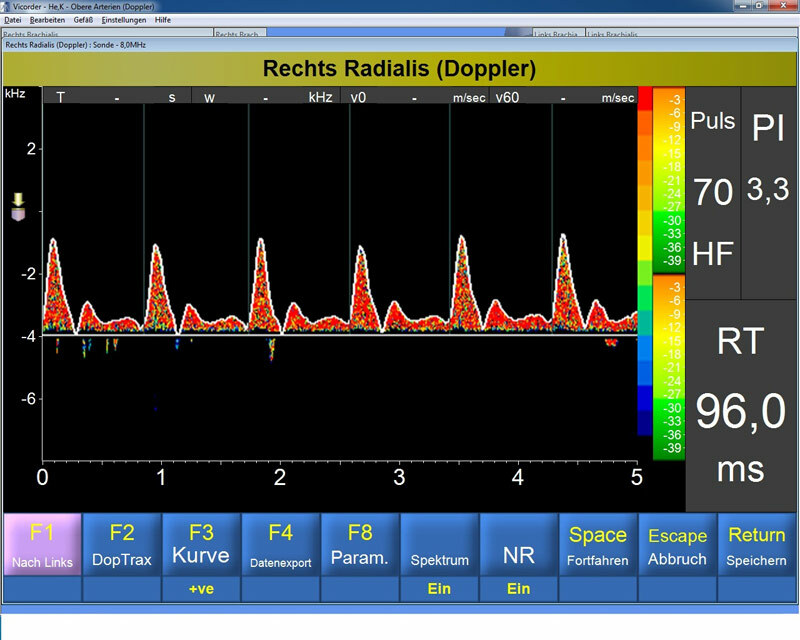 The VICORDER® Doppler also comprises protocols for insonating brain supplying and periorbital arteries. Both, Doppler audio signal and spectra are of highest quality and will satisfy even the most demanding application. The remote control, an important feature in Doppler testing, has been directly integrated into the VICORDER® case. Facilitating the many, almost unlimited testing capabilities of the VICORDER®, all procedures are automated by intuitive test specific protocols. 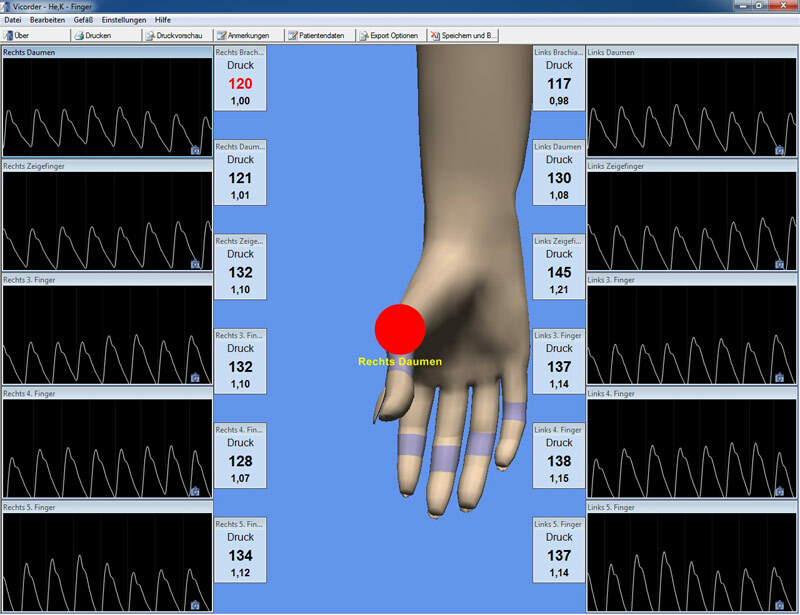 3-D animated anatomical displays of testing sites help accelerating the testing sequence. 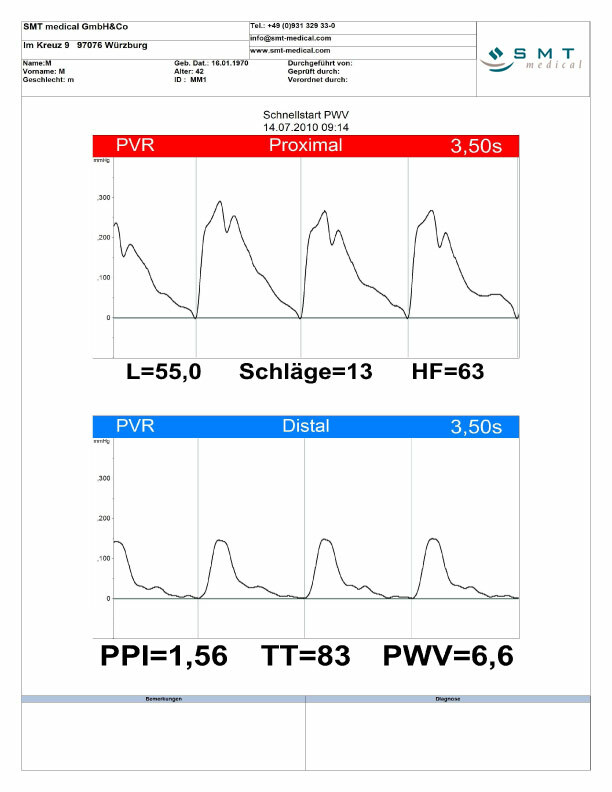 Photo and Pulse Volume Plethysmography require little operator interaction, saving valuable time and thus cost. 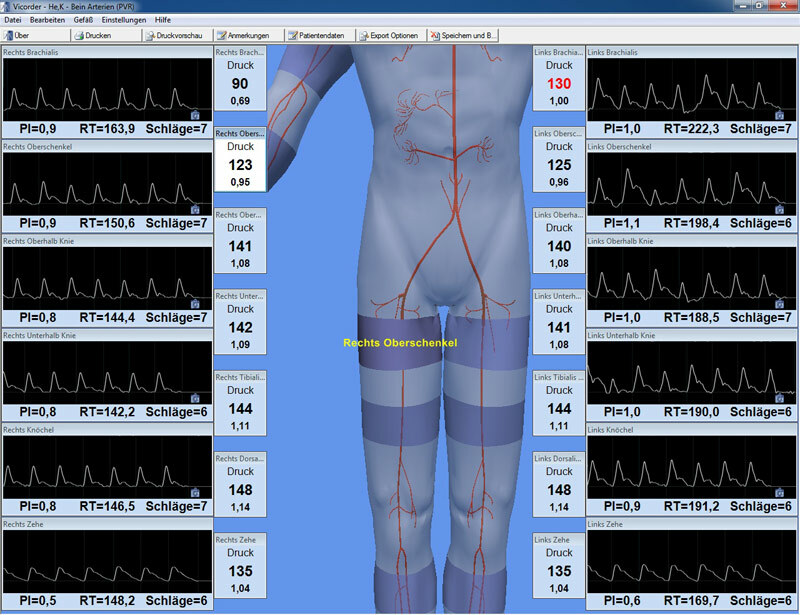 The automated, direct determination of aortic Pulse Wave Velocity (PWV) according to the carotid-femoral Gold Standard in less than five minutes is a good example of the unique efficiency of this instrument. Besides the many testing capabilities, the VICORDER program package incorporates also a patient record management system. Concise test reports document all important diagnostic details. Impressive reports can be printed in pdf format, directly or remote, stored locally or on a server, sent by eMail, or placed into the patient record within the hospital information system (HIS). VICORDER® comes complete with Doppler probes, cuffs, PPG sensors, and the VICORDER® program package, easily to be installed on your PC of choice. No expensive disposables, no hidden cost. When applying the VICORDER in your daily practice, you will appreciate the profound technical expertise and know-how in vascular testing and Doppler sonography that has been incorporated in this instrument. Profit from this experience that makes VICORDER® amazingly effective, user friendly and cost efficient!